Venture Vehicles has formally announced in Los Angeles, the development of a revolutionary three wheel, tilting, plug-in Hybrid vehicle under the working name VentureOne. This ‘super samlor’ carries two passengers and has a hybrid engine returning 100 mpg, accelerate from 0-100 kays in six seconds, will have a top speed of over 160 kph, and is priced at under US$20,000. In addition to the low-emission, flex-fuel hybrid model, a zero-emission all-electric version is also being developed that will have an all-electric range of nearly 200 miles. A key feature of the VentureOne is the patented Dynamic Vehicle Control tilting technology from Dutch-based Carver Engineering that allows the body of the vehicle to actually tilt when going through turns while all three wheels maintain firm contact with the road. Carver already sells petrol-engined versions of the machine, and the Phiaro 3-wheeler is also closely based on the Carver. But a plug-in hybrid with a 200 mile electric range and sportscar performance is very enticing. Production is not scheduled until late 2008 and Venture Vehicles will initially offer two propulsion packages for the VentureOne: the hybrid E50 and Q100, and all-electric Venture EV model. The US$23,000 all-electric model will top the range while the E50 hybrid will sell for US$18,000 and the Q100 hybrid is expected to be priced under US$20,000. “It’s a truly unique and innovative vehicle,” says Ian Bruce, one of the founding partners of Venture Vehicles. “With the same height and length as the MINI Cooper, the VentureOne will have both the performance of a sports car and the agility of a motorcycle, creating an incredibly exhilarating driving experience. The only way I can describe the sensation is comparing it to flying a jet fighter at two feet off the ground. Plus, this extraordinary performance combines the significant environmental benefits of a flex-fuel, plug-in hybrid with a high level of affordability.” Two electric pancake in-wheel motors will power the two rear wheels, with a small combustion engine providing on-road recharging. When garaged, it need only be plugged into a normal 110 outlet. Regular readers will recognize this as the principle behind the Lohner-Porsche of 1902! Safety is another crucial aspect of the VentureOne’s design. The vehicle will be surrounded by a steel “safety cell” providing overall protection, along with other important safety features typically found only in cars. Things like a driver’s airbag, front and side-impact protection, and rear bumper will be standard. A host of world-class partners in design, engineering and production are supporting the development of the VentureOne - firms such as BMW DesignWorks, A123 Systems, Carver Engineering, Swift Engineering, Boshart Engineering and PML FlightLink. The VentureOne weighs approximately 600 kg in prototype form, with an overall width of 1.25 m, a length of 3.5 m, and a 2.5 m wheelbase. The engine is located in the rear of the vehicle at a low height. The passenger compartment and the front wheel tilts when cornering; however, the forces are aligned with the vertical axis of the driver’s body, resulting in the driver being pressed into the seat rather than pushed across it, as per the usual motorcycle practice. 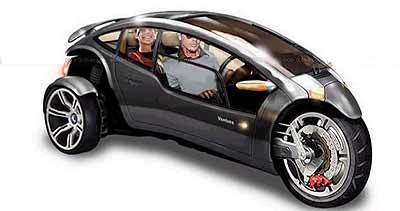 Although classified as a motorcycle according to the NHTSA (since it has three wheels), the VentureOne has an enclosed body. The reinforced roll-cage construction in combination with front-and-side-impact protection, and a highly efficient passenger restraint system, give the occupants a level of protection comparable to conventional cars - or statistically, 33 times the safety of a typical motorcycle. All VentureOne’s will incorporate the patented Dynamic Vehicle Control system, or DVC™, developed by Carver Engineering, which allows the vehicle to tilt up to 45° side-to-side at a rate of 85° per second, plus ventilated disc brakes. The vehicles’ propulsion system is of a series hybrid design. The system consists of a small internal combustion engine connected to a 15-20 kW generator, two in-wheel 25 kW electric motors, a four gallon fuel tank, and a 3 kWh Li-Ion battery pack. The system is able to take energy normally lost as heat due to braking and return it to the battery, increasing overall system efficiency. Last week I mentioned that the name Cooper is famous in motor racing. I asked when and where did a Cooper first have its overseas success? Clue: it was in Asia. It was in April 1949 when a Cooper won a hillclimb in what was then called Ceylon. So to this week. What famous racing driver was married to Charly? Clue: He was faster in the wet at the 1929 Tourist Trophy than all other drivers in the dry.